As I have mentioned a couple of times in previous posts. Most of my tours nowadays are of an educational nature. My last tour was of a religious background, this one was of farming interest. On board were a bunch of great Bavarian farmers. With this post, I’ll be introducing a “typical” educational farming tour and will also give you an insight into the work of a tour guide in Ireland. What is it about Bavarian Farmers? Bavaria is the most southerly state (Free State) of Germany. Bavaria is with ca. 70.500 sq km a bit smaller then the Republic of Ireland and roughly makes out 20% of German territory. However, with 12.5 Mio. inhabitants, Bavaria has a little bit less then three times the population of the Republic of Ireland. Munich is the capital of the Free State and has a population of 1.5 Mio (urban 2.6 Mio.). Munich is Germany’s 3rd most populous city and also the most expensive one to live in. Farming in Bavaria is in many ways different to farming in many other parts of Germany. 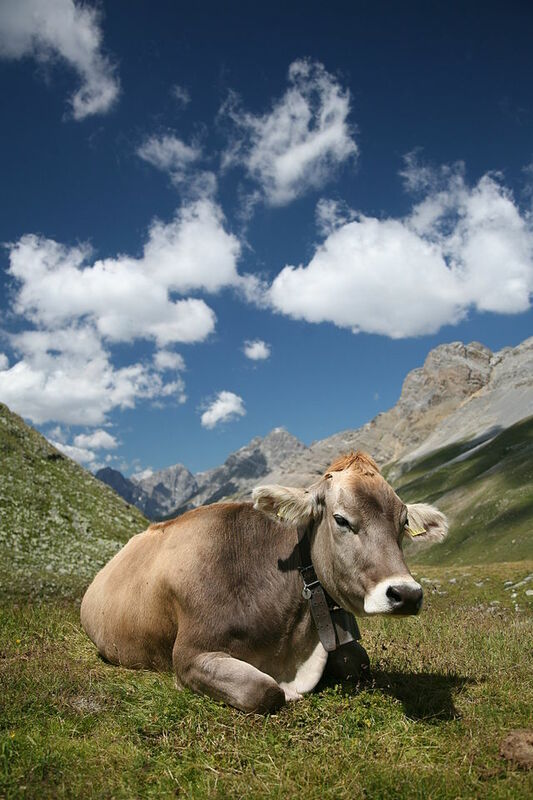 The German Alps, for example, is still the home for many Alpine farming communities, which farm in very traditional ways. Otherwise, dairy, tillage, pig and beef farming feature in Bavaria. One major difference between Irish and Bavarian farming, is without a shadow of a doubt, the climate. Very hot summers and very cold winters, dictate a different way of going about daily business. Sheep farming is also of great importance in Bavaria, but of a completely different nature then in Ireland. In Bavaria, just like in other regions of Germany, you have roving shepherds who move with their flocks through the countryside. Here’s the itinerary of the tour with the Bavarian farmers. Another insight into my life as a tour guide. Today at 5 p.m 45 German (Bavarian) farmers plus one tour leader landed at Dublin Airport. We got to the Ashling Hotel at around 6:20 p.m., checked in and had an hour to freshen up. Dinner was served at 7:30 p.m.
We’ll be spending 8.5 great days together and I’ll be reporting about it as we go along. We were supposed to leave the hotel at 9 a.m., but hey – how can a tour start without any glitches. At 9 a.m. all but two clients were on the coach. Germans are great timekeepers, as everyone knows. We quickly established that nobody had seen those two ladies for breakfast. Neither had the ladies mentioned any attentions of fleeing. At this stage, I generally explain to my clients that it doesn’t make any sense whatsoever to try and leg it. “Your’re on an island, we’ll find you”, are my words. The tour leader, who came over with the group, made her way back into the hotel to ring them in their room. It transpired, that the ladies had not adjusted their clocks and tried to calculate the local time in their heads. During this process, they got confused. While I was waiting for the two missing clients, an elderly gentleman approached me and explained that he will have to go back to Germany on Wednesday. He has unbearable pains in his joints and doesn’t think that he can stick it out. He’s waiting for a hip replacement he added. Before going on holiday, his doctor in Germany gave him an injection, thinking that this might carry him through – but no – it didn’t seem to do the job. Great. I do of course feel for the client. On the other hand, it just means extra workload. It’s not a matter of waving him goodbye and wishing him all the best. All kinds of things need to be put into place, including flights and getting him to the airport and on to the flight. We eventually left the hotel at around 9:15 a.m. to do the City Tour. All good. We started the day with light rain and not much wind. Since we had so much time on our hands, we did a very detailed City Tour. We left the Ashling, went along the Quays to go up and down O’Connell Street. Turned left into Abbey Street, down pass the Custom House and all the way up and down North Wall Quay (to The Point and back). 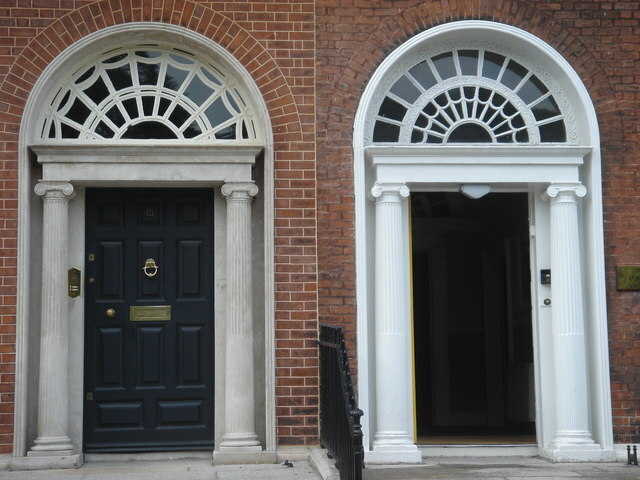 Across the river, along Pearse Street and through College Green to Nassau Street. Here we got off the coach and headed in to Trinity College to see the Book of Kells etc. After that we headed into the Georgian Squares, pass Stephen’s Green, down Dame Street, pass Dublin Castle, Christ Church, St. Patrick’s Cathedral and on into Phoenix Park. Bavarians are predominantly Catholic, so we headed to the Papal Cross. The weather had cleared. It was dry, but extremely windy – I would even say stormy. We headed back to Nassau Street and allowed ourselves a couple of hours for lunch. Everyone did their own thing. After lunch, we headed straight to the Guinness Storehouse. I have mentioned in a previous post, that I find that the Guinness Storehouse is very overrated. Never mind what age group, I always find that people can’t wait to get out, once they realised that they’re subjected to 7 floors of intense advertising. The noise level inside this establishment is unreal. I seriously wonder how this agrees with health and safety. Not only in relation to our clients, but especially for the (very nice) staff which works there. The clients got a guided tour. This is not always the case. A lot of times, the visit is self-guided. Foreign language clients generally get an introduction in their own language and are then left to their own devices, which is very much appreciated by the clients. Multillingual audio guides can be borrowed free of charge. The climax of this visit is definitely the 7th floor. A penthouse bar, with 360 degree view over the skyline of Dublin City and beyond. 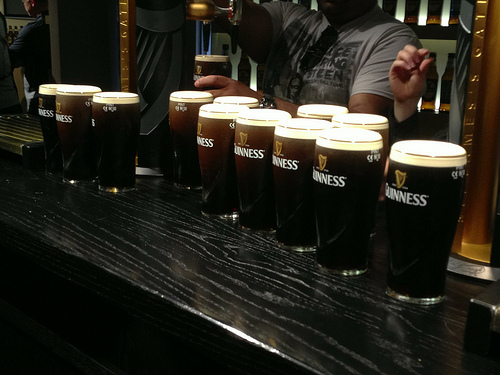 On the fourth floor, it is also possible for clients to pull their own pint of Guinness. They receive detailed guidance and then a diploma, which looks good in anyone’s curriculum vitae. We arrived at the Storehouse at 3 p.m. and will be leaving at 5:15, to be back at the Ashling Hotel for 5:30 p.m.. Dinner is booked for 6:30 p.m. The tour leader approached me at the breakfast table, telling me that our “patient” has decided against going home early – suggesting that he needs to buy some walking sticks and that he would also like to see a doctor. I couldn’t believe it. We spent all of yesterday in Dublin City and my suggestion to see a doctor didn’t find any takers. Today, where we were to leave Dublin to spend the day in the Wicklow mountains, we’re supposed to find a doctor and a shop to buy two walking sticks? No way, Jose. I explained to the tour leader that this was not possible. We could have done that yesterday and I suppose we would have a chance to do it again tomorrow, when we’re in Kilkenny. 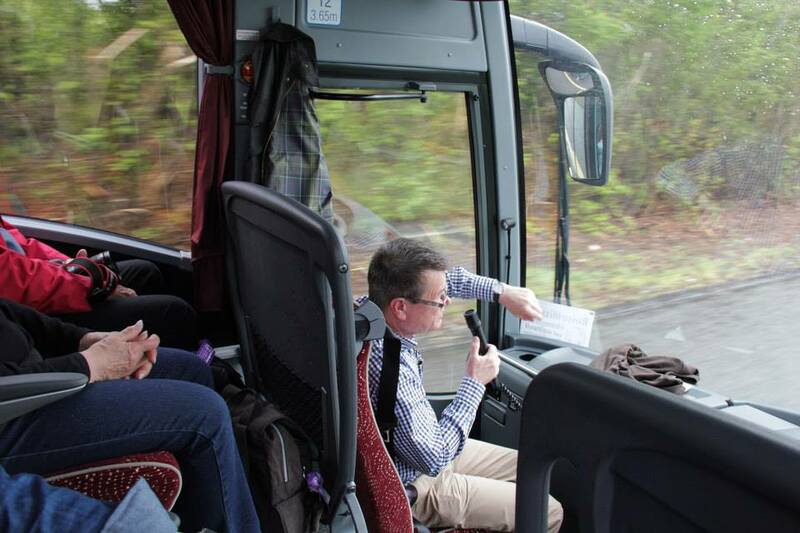 We can’t drag 45 clients around town and disturb the smooth running of the itinerary. We were due to leave at 9 a.m.. I was down by the coach at 8:45 a.m. The client was sitting in his seat. I went up to him and suggested that it would probably be the best option for him to go to St. James’ hospital and get himself an injection. He rejected this, as he rejected every piece of advise I had given him so far. I saw the tour leader appear in the hotel door and made my way over to her. 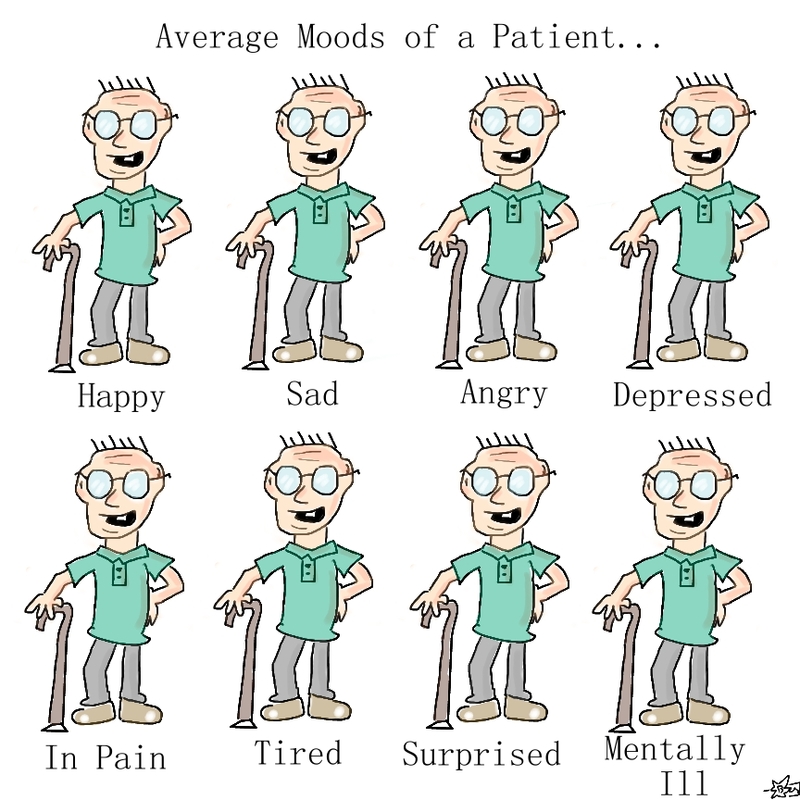 I explained to her that I had made several suggestions the “patient”, but that he wouldn’t have it. Next thing I see that client crossing the Luas (tram) tracks, heading for us. He repeated that he would not want to stay behind to go to hospital. “What am I supposed to do all day on my own?” were his words. I saw the Luas approaching. I tapped on his shoulder and pointed into the general direction of the moving tram and tried once more to help by saying “why don’t you throw yourself in front of the tram, this would sort the pains once and for all”. Again, he rejected my expert advise. We left the hotel spot on at 9 a.m. The sun was shining brightly. It was a beautiful calm day, after yesterday’s storm. Bert Cagehin, my driver, decided to make his way through the City. The traffic was enormous. One can tell, that the recession is coming to an end. 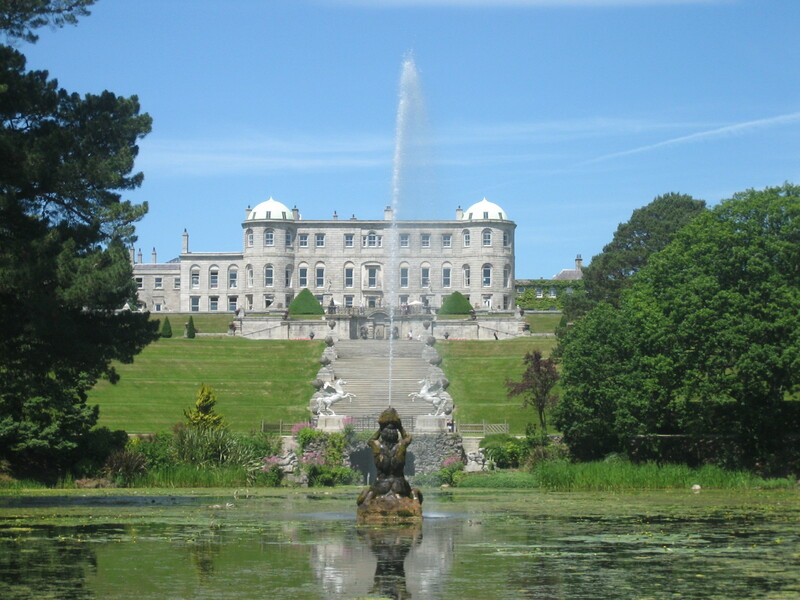 We arrived at Powerscourt House & Garden at 10:20 a.m. and decided to stay there until 12:30 p.m.. The weather continued to spoil us throughout the stay at Powerscourt. 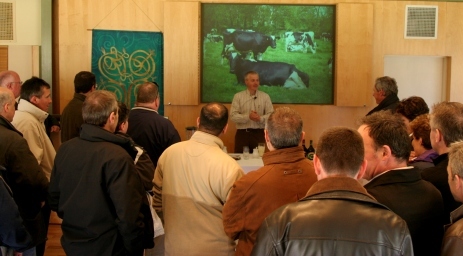 Hayden’s Farm and The Orchard Centre is a great address for farmers and incentive groups alike. We were booked into Hayden’s Farm for 2:30 p.m.
Leaving Powerscourt at 12:30 p.m. meant that we were going to be there before that. I rung the farm, to let them know that we would be arriving a little bit earlier. You can’t just turn up whenever you want with a group. Especially not with 40+ plus people. For all you know, they may still have other people to look after. Anyway, they were happy to take us in at an earlier time. Louise was quite happy and told me, that she expects us to arrive at around 1:45 p.m. I personally didn’t believe that, but hey, she is the expert about that, so I did keep this in the back of my mind. The earlier, the better. It would give the clients a bit more time and it would also allow us to leave that little bit earlier to get back to the hotel. My aim is, to get to the hotel about an hour before dinner. This gives the clients a relaxed feeling about the whole outing. 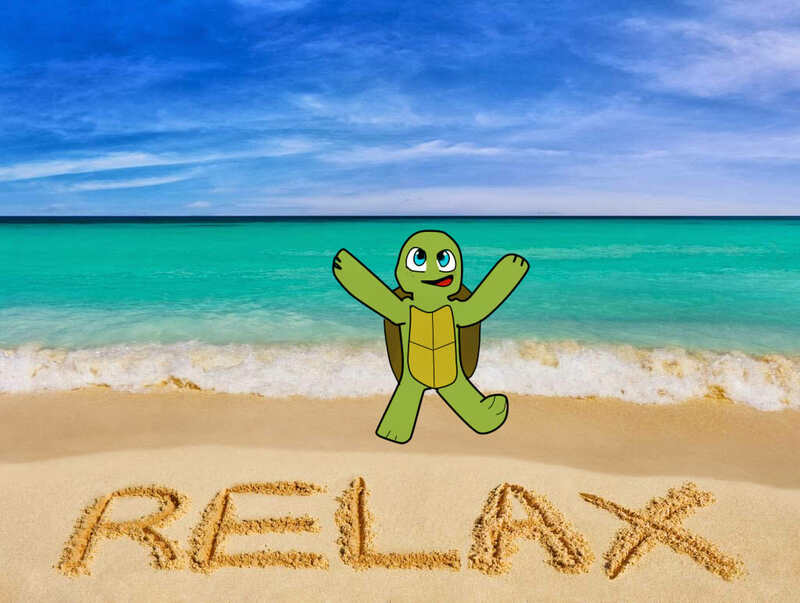 Being able to freshen up, or to just relax for a little while before getting back into the crowd. Anyway, we arrived at the farm at around 1:50 p.m. Louise and her estimate were spot on (well, nearly – I guess she isn’t German). Joe himself was there to greet us. Joe is a very special man. He’s always ever so pleasant. As I got off the coach, he gave me a big smile and we shook hands. We’ve known each other for many years now. Every time I pull up at his farm, he comments on how ever so happy my clients are and you know what? – He’s right. Anyway, there he was – standing at the front door of the coach, shaking each and every hand of the clients and saying “Hello, welcome to Hayden’s farm, my name is Joe”. Suddenly we realised that there were people appearing from behind the coach. This was funny. Joe quickly ran to the back of the coach. He didn’t want clients to feel that he was only looking after a few of them. I was ever so proud of my group. You know, Germans are generally very formal. They would normally not introduce themselves with their first name. It would be last name only. However, I had briefed them very well. They understood, that in Ireland, it’s first name only. Unless you have issues with someone. As my clients got off the coach and Joe introduced himself as “Joe”, my clients introduced themselves as “Georg (George) and Johannes (John) etc. I thought this was absolutely great. Joe invited us into the visitor centre, where my clients had a chance to “wash their hands” before having a nice cuppa of either tea or coffee and scones. Joe is a great man. He introduced himself and his farm (I translated) and received a roaring applause at the end of it all. 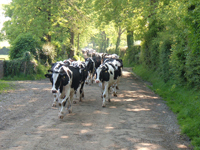 We then headed out to meet his “daughters” – meaning, some of his 150 cows. He talked about the pasture, the grass. He also talked about minerals and other farming stuff, before taking us to the next generation of Baileys Ladies, his calves. Our last visit was in his milking parlour, where he milks 150 cows in 90 minutes and that twice a day. 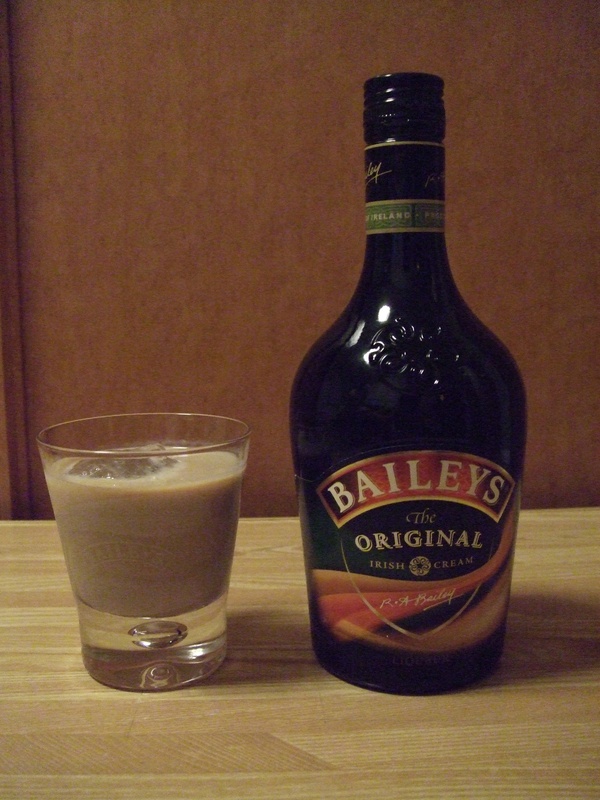 Before we got back on to the coach to head back to Dublin, most of the clients couldn’t withstand the temptation to try one or the other Baileys, which were served in the visitor centre. A great day came to an end. In contrast to the previous day, we were greeted by rather wet and very windy weather. It was a day of farewells. 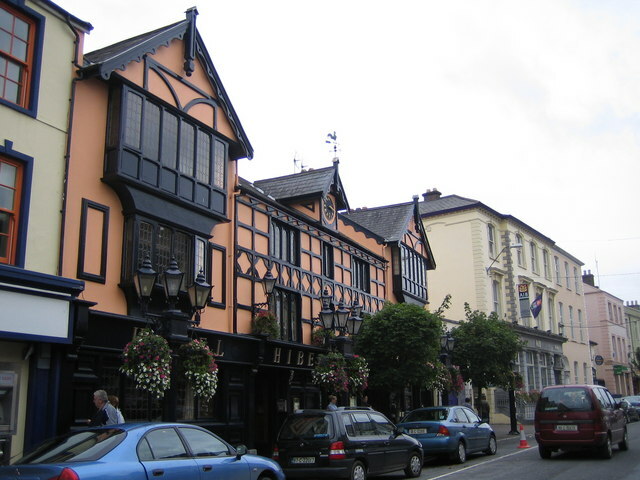 Three nights we spent in the Ashling Hotel. Today, we were leaving Dublin to travel via Kilkenny, Cashel, Mallow, Killarney on to Tralee. 90 minutes, from the outskirts of Dublin to Kilkenny, should normally be sufficient. As we left Dublin we got stuck in some unbelievably heavy traffic. We didn’t get to Kilkenny until 10:45 a.m. and were at the Smithicks Experience at 11 a.m. The Smithicks Experience only opened last year and it was my very first visit there. I rung the gang there while we were on the way and let them know that we were running late. It didn’t seem to be a problem. My group with 46 clients, is rather big. They had to split it into two. This means we were to lose even more time. There was a roughly 15 minute delay, before the first and the second group. The clients got an audio guide each. An English speaking guide was walking with them and kept explaining things over the audio guide in English. This didn’t help at all. The clients kept looking at each other all confused. It should either be in English and the Guide (me) translates, or it should be audio guides. Audio guides in a foreign language and English explanations don’t go together. I have been to many Irish Whiskey museums and to Guinness. Maybe that’s why I was somewhat underwhelmed. If you have ever been to a Whiskey distillery or a brewery, then you don’t need to see this as well. Unless of course, you want to know about the story of the Smithwick family. When you consider that an adult tickets costs €10.80 (online booking), then you might prefer to read up on the Smithicks history. After the tour at Smickwicks I legged it and got some Nurofen Plus and Paracetamol for our “patient”, before I had a bit of lunch. We meant to leave Kilkenny at 1 p.m. I knew it was tight, because we didn’t get to Smithwicks until 11 a.m. and the second group wasn’t finished with their tour until well after 12 p.m. It was 1:30 p.m. before the wheels of the bus went round and round. We lost 30 minutes. That’s quite a lot for a day. Timing is at the essence when you’re a guide. It’s your job to get the day’s itinerary done. You have to plan things minutely and have to run it through the day, without the clients really realising it. 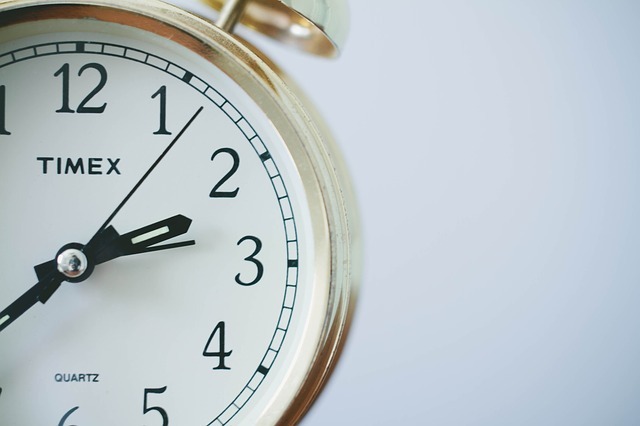 You can’t push the clients to move on, because you’re running late. This should not be the client’s problem. The art of a good guide to have a smooth day is to make sure you suss out your people and set the timing accordingly, without them feeling rushed. So here I am, I’m running 30 minutes behind. We left Kilkenny. 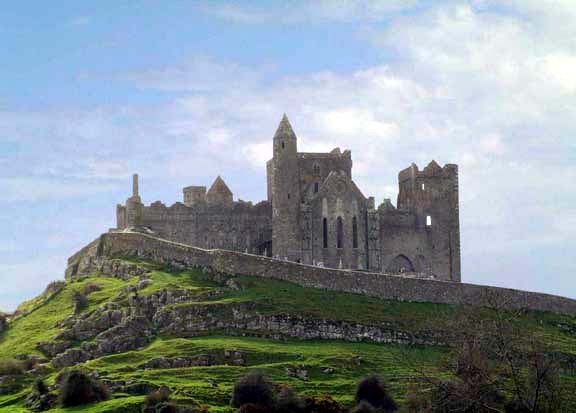 Thanks to my driver, Bert Cahigan, we actually arrived in Cashel at 2:15 p.m. That was good going. I’m more or less, just about, back on track. I gave my group my own, detailed. tour of the Rock of Cashel. Our patient stayed behind. He found that the climb up to the Rock was too much for him. He found himself a little cafe to chill out. After We left Cashel at 3:40 p.m. We were running late again. I didn’t want to leave Cashel any later than 3:30 p.m. My driver had an issue with parking in the official coach park. He didn’t want to pay the €4 parking fee, even though he gets it reimbursed. However, that’s where the public toilets are and most of my clients would want to use those before heading on to Kerry. The driver decided to wait about 300 m down the road, which added to the loss of time. Next stop Mallow. There, we stopped for a little toilet and coffee break. I like stopping there. 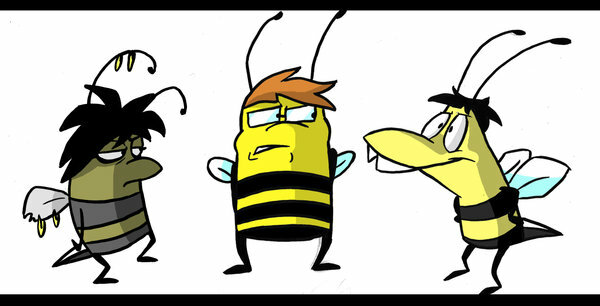 It’s a nice little town with a bit of buzz. I normally send my group into the Hibernian Hotel for toilets and do of course recommend to them to have a cup of coffee or a piece of cake. Most of them take that up. We arrived at the Fels Point Hotel, in Tralee, at 7 p.m. I originally booked dinner for 7, but as the day went on and I saw us getting more and more delayed, I rescheduled it to 7:30 p.m. I hate arriving that close to dinner. Especially with luggage. Considering that some people might want to freshen up and that most of them are sharing rooms and therefore bathrooms. However, it was the way it was. Those things happen. We left the hotel at 9 a.m.. It was wet and windy. I knew though, that this was going to change. We were heading south west, and from this direction, the weather was going to clear. We went via Castlemain, Milltown and Killorglin and had our first photo stop just after the Red Fox on the left hand side. 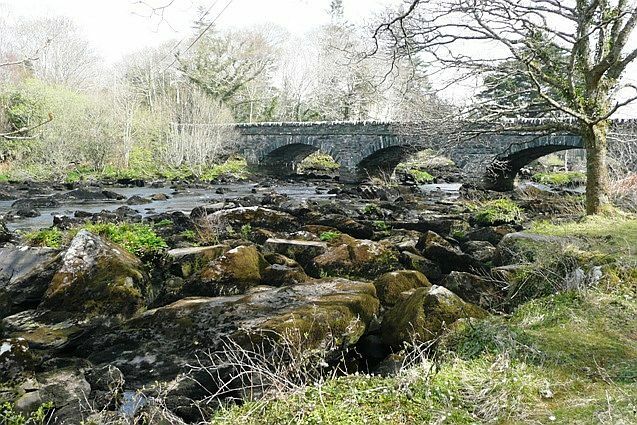 It’s a beautiful view over the Caragh River with a beautiful backdrop of the MacGillycuddy Reeks. I never stop at the Red Fox (except if it is on the itinerary). The Red Fox is the best example of Ireland, what I want to avoid. 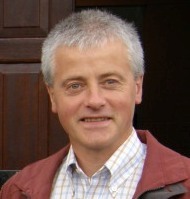 I want my clients to have more time with authentic, not purely for tourists, sites of Ireland. The first comfort stop we had was in Caherciveen. En route we had another photo stop at Dingle bay, just before Kells. Caherciveen is another nice little town. 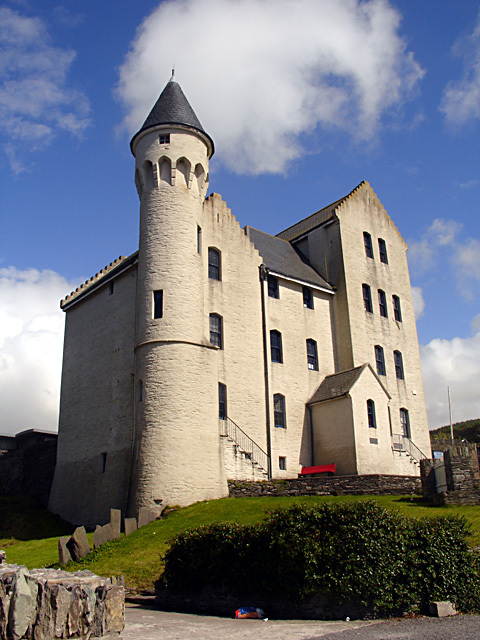 People love to discover the O’Connell Memorial church and love the idea of the Old Barracks in Caherciveen. There are also some beautiful little cafes in Caherciveen. One of them even makes their own chocolate. From Caherciveen we travelled to nearby Waterville. We arrived there at 11:20 a.m. and stayed for lunch. We left at 1 p.m. It’s also a great little place for people to chill out and enjoy the sea. Especially Bavarians who are landlocked. One lady in the group told me that this was her very first time at the seafront. She recorded the waves and sent the clip to her daughter. How nice is that? I always recommend the Beachcove Cafe, next to the post office. In my opinion, they serve one of the very best fish and chips you can get in the country. It’s so fresh, it’s still moving. People absolutely love it. The portions are so big, that you can generally share one. I generally go into the Fisherman’s Bar (which is part of the Butler Arms Hotel) for a seafood chowder. The chowder is one of a kind and the home baked bread that comes with it is worth a visit in it’s own rights. It was too early in the year. The bar wasn’t serving lunches yet. From there we headed via Sneem to Moll’s Gap. On the way we stopped at Coomakista for a photo. Avoca at Molls Gap had only opened that morning for the season. After Ladies View, we had a quick 45 minute stop at Muckross Garden, before heading straight to the Eviston Hotel in Killarney. There, the group had a chance of learning how to make an Irish Coffee. They made their own. We were back in our hotel by 5:45 p.m. and had dinner at 7 p.m. The day started with a timing problem. The Connacht Hotel, where we were to stay for the next couple of nights forced my group to have an extremely early dinner time. 6:30 p.m. is ridiculous for a group with an itinerary like ours. Sometimes the people in charge in those hotels don’t realise that they can actually really mess up a group’s day, by not offering decent meal times. The hotel had quite clearly taken on too many tours to cater for. For us to leave earlier to make more of the day, was not an option either. It would not have made sense to arrive at Bunratty any earlier, since we would have stood in front of closed doors. 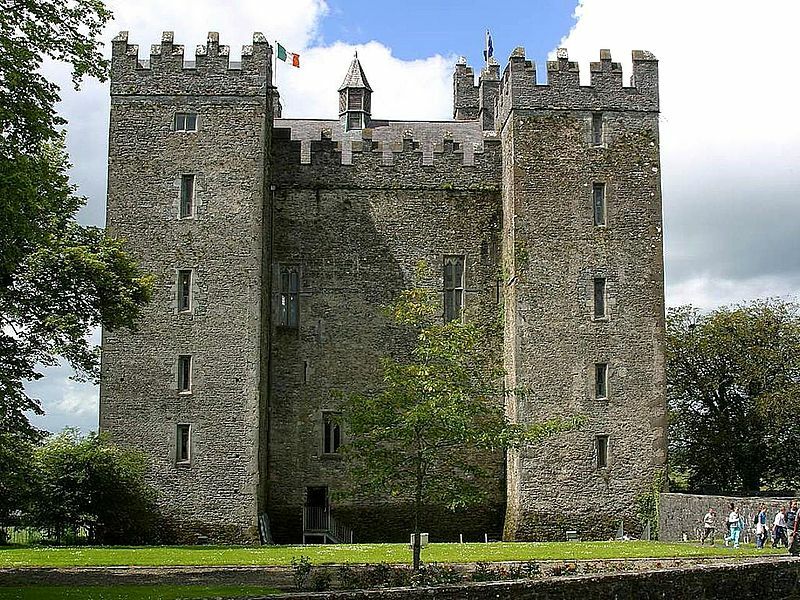 We left the hotel at 9 a.m. and arrived at Bunratty Castle at 10:40 a.m. Normally, you would want to have 2.5 hrs for a visit. We only had about an hour and twenty. So I advised the clients to decide on whether they would like to focus more on the castle or on the folk-park. The fact that there happened to be no German guided tour of the castle, made things easier. It was actually the first time in 15 years that I had no German language tour in the castle. We arrived at St. Tola Goat Farm at around 12:45 p.m., which was about 15 minutes after schedule. Grainne gave us a great little tour and told us all about goat farming and cheese making in Ireland. The visit was rounded up with a goat’s cheese sampling. I took some with me. It made a beautiful little lunch at the Cliffs of Moher. 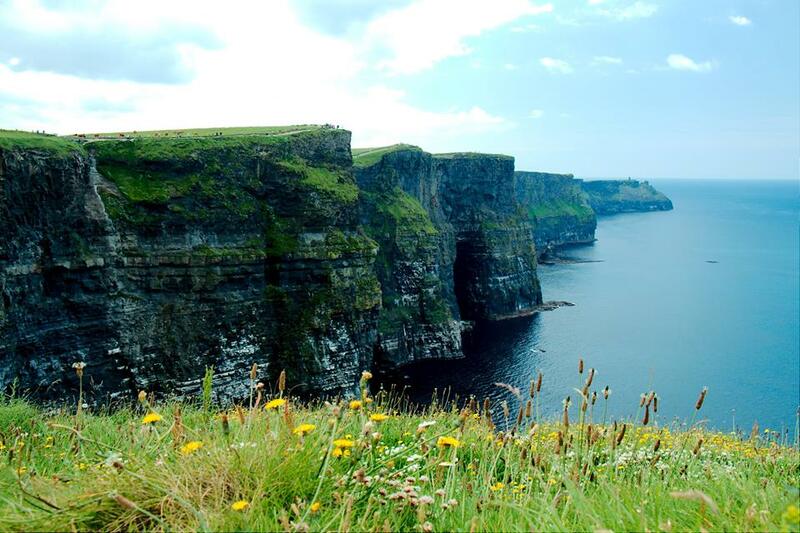 We got to the Cliffs of Moher at 2:20 p.m. and stayed there until 4 p.m. This was a nice relaxed visit, which gave us enough time to enjoy a (rather late) lunch. From there we travelled via Lisdoonvarna, down the corkscrew and through Ballyvaughan to Galway. We arrived at the hotel at 6 p.m., which gave us only 30 minutes to freshen up for dinner. We left the hotel at 9 a.m. It was a glorious sunny day. 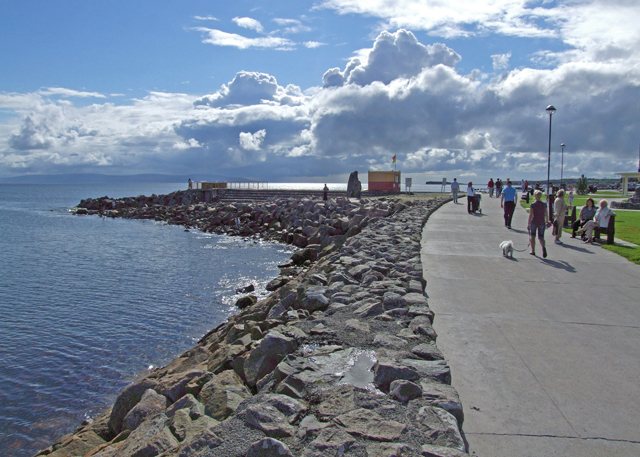 We started the day with a nice little drive along the coast, through Salthill and up to Spiddle. Toilet stops can be a bit of a challenge with groups on this day. We therefore did a half an hour pit stop at Stauntons, before continuing via Maam Cross and Recess to Kylemore. On the way we did a few photo stops. 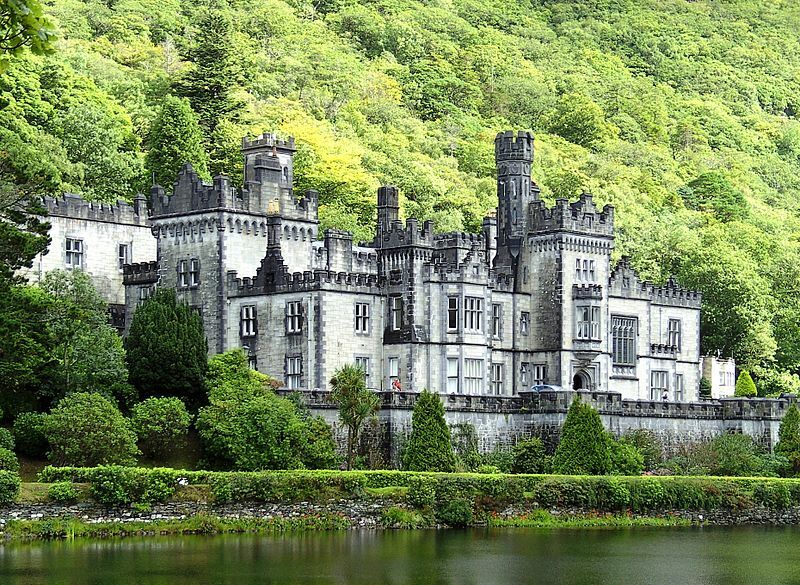 We arrived at Kylemore Abbey at 11:40 a.m. and stayed until 2:20 p.m. It’s a great place to have some time, including lunch. 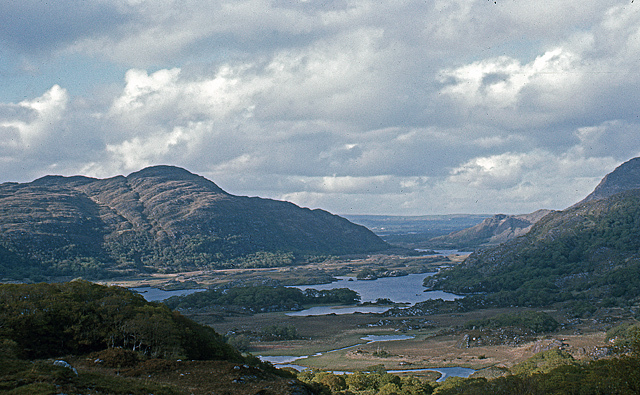 From there we travelled deep into the Connemara mountains. Our destination was Joyce Country Sheepdogs. For many of my farmers, this visit was the absolute highlight. 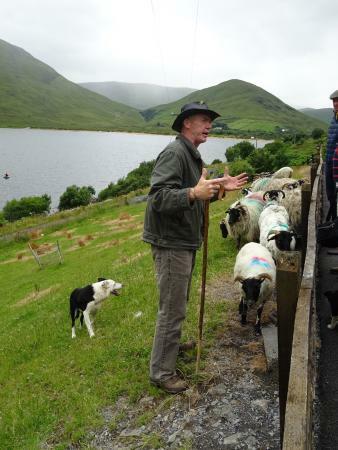 Joe directed two of his sheepdogs (one at a time) around the rugged Connemara hillsides, to move his sheep. A great show. We were back at the hotel at 5:45 p.m. and dinner was booked for 7 p.m. I was somewhat tired and was looking forward to going to my room to relax a little bit before dinner. But it was not going to happen. As I was standing in the lobby of the hotel, a client came up to me and asked me to assist her to find some Irish music with Irish language singing. Then a lady approached me and told me that her husband was sick and that we needed to go to a pharmacy – NOW. I legged it with her to the pharmacy across the road. We just about made it and got the medication she required. I got back to the hotel and grabbed the menu and sat down to translate it for my clients, when one of the receptionists called me over. She told me that one of my clients was on the phone and that she was sick. The German speaker at the other end of the phone was not one of my clients. I could hear that on the dialect, it was a Northern German speaker. She explained to me that her husband was sick and that she needed a pharmacy – NOW. I was tired. I really didn’t have the energy to look after every German speaking guest in this hotel. I suggested to her that she comes down to the lobby and I would write her a note to take to the nearest pharmacy. More I couldn’t do. I than established that she was travelling with a guided tour and I didn’t only know her guide, but I had the guides phone number in my address-book. I contacted the other guide and told her about her client. She at first didn’t want to know. It appeared to me that she wanted me to look after her clients. Anyway, I just passed on the buck. I had enough. I commenced to translate the menu. Just as I was going to leave the lobby to head to my room, my driver waved frantically. He wanted to introduce me to the relief driver, which was going to take over the next day. We left the hotel at 9 a.m. and headed straight out to Kilbeggan, for the distillery. 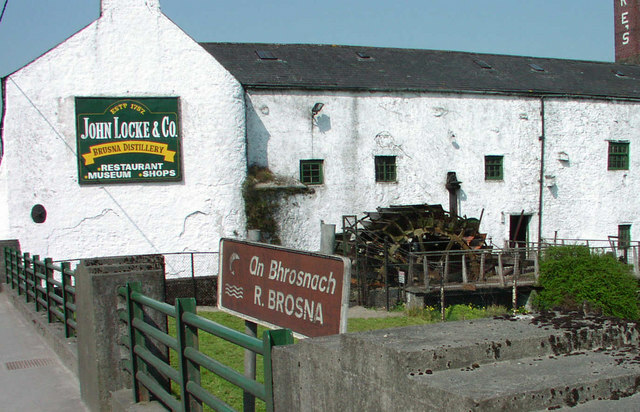 There, the group enjoyed a guided tour in German, which included a sample of Kilbeggan Whiskey. We arrived there at 10:20 a.m. and left again at 11:15 a.m. The whiskey bar was still closed, because it was Sunday. Therefore the group didn’t need any time for shopping. 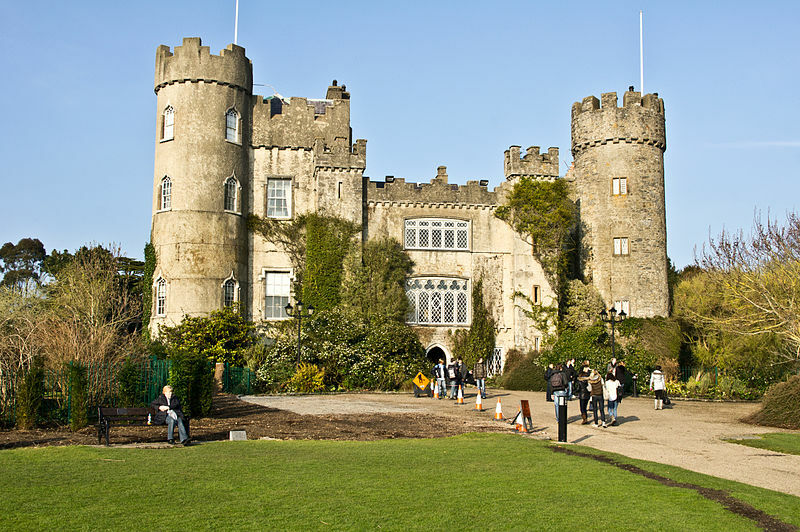 From there we headed straight out to Malahide Castle. The visit was scheduled for 1 p.m. This didn’t make sense, since the group had not had any lunch yet. I managed to reschedule it to 2 p.m. This gave the group plenty of time to first have lunch and then enjoy the tour. I have to say that the Avoca Restaurant at Malahide Castle does have fantastic food, but they’re also over the top expensive. A sandwich knocks €7.25 off your budget. That’s nearly criminal. A couple of my group had two soups, a couple of sandwiches and a bottle of water (maybe also a dessert, not sure) and were asked to cough up around €36. I mean, if that’s not over the top, then I don’t know. We arrived at Malahide at 12:40 p.m. and left at 3:15 p.m. for Dublin Airport. I’m looking back at an enormously successful tour. The clients were more then happy. A lot of the clients had tears in their eyes when we said goodbye at the airport. What a lovely bunch. By the way. For people who are not in tune with those kind of coach tours. The distances we covered driving, were not done in silence. I used opportunities to introduce my clients into the world of Irish music and I also used those slots to feed my clients with information about this beautiful country. Every day I would pick certain topics, which I would then cover throughout the day. Whether it’s history, school system, health system, EU and Ireland, church and Ireland, life of pensioners in Ireland, Clerical abuse, farming, policing etc. You name it, I covered it. 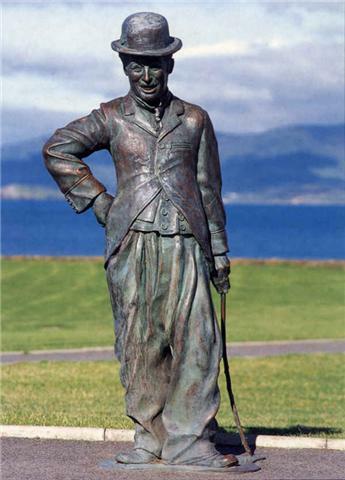 So, when my clients leave this beautiful island of Ireland, they very well know where they have been.